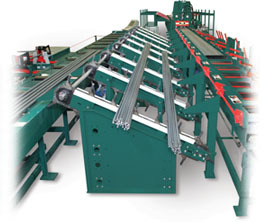 The KRB Bar Transfer System allows bundles to be accumulated prior to discharging onto a bending line. This reduces crane time and the additional handling of bundles when transferring them to bending lines. The shear operator can accumulate bars in the chain drag pockets by advancing or reversing the chain.